Yamaha YSP-4300 review | What Hi-Fi? Every AV company with even half an eye on the market knows that soundbars are all the rage these days. But while big hitters such as Bose and Sonos are only just getting in on the act, the Yamaha YSP-4300 is refining a range that it’s been developing and selling for absolutely ages. What’s more, it’s still the only company that’s really doing it properly. The key to the YSP-4300 is the Intellibeam system, which uses an array of drivers to bounce sound off the walls of your room to deliver a surround-sound experience that’s as authentic as it gets without filling your room with speakers. It’s still the best way to do it, and it has still not been copied effectively. Considering the old Yamaha YSP-4100 and Yamaha YSP-5100 were still relatively unchallenged at the top end of the soundbar market, it’s something of a surprise that the YSP-4300 (and the smaller YSP-3300) is such a departure. Unlike the previous models (but in line with the rest of the range) the Yamaha YSP-4300 now comes with a subwoofer. An extra box might be a disappointment for minimalists who find soundbars so appealing, but it is at least a wireless model, and one that can be placed horizontally on a shelf or vertically out of sight. 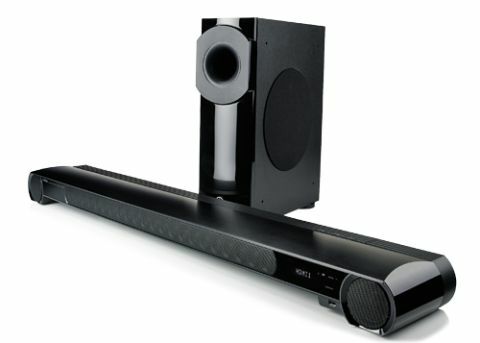 With the bass frequencies being handled elsewhere, the soundbar itself can be slimmer, and thanks to thoughtful design features such as a shape that will straddle a TV pedestal stand and an IR repeater that means it won’t get in the way of your TV remote’s signals, this is a unit that will neatly fit into your setup. Talking of set-up, it takes just a couple of minutes with the bundled mic attached before the Yamaha YSP-4300 has been calibrated to best send sound to your listening position. And fed a Blu-ray of Jack Reacher via one of the four HDMI inputs, the results instantly impress (even if the film itself doesn’t). While effects don’t make it right around the listening position, they do fill the entire room from the sides forward, and that makes for a big, open and atmospheric performance that’s always involving. Adding to the scale of the delivery is the subwoofer, which supplies copious bass but blends seamlessly with the mid and treble from the soundbar, adding a hefty dose of powerful bottom-end to the exhaust note of Reacher’s ‘borrowed’ Camaro. Switch to a game with a great surround soundtrack – Tomb Raider on PS3 will do nicely – and we’re equally happy. Again, you won’t get sounds appearing behind you, but the expansiveness and three-dimensionality of the delivery will transform how you engage with the game, especially if you’ve previously just been using flatscreen speakers. Add the sort of punch and dynamics that really make the most of every chunky gunshot on the 5.1-channel PCM soundtrack and you’ve got a great system for gaming. And music? Actually, not so good. Leaving the soundbar in the 5BeamPlus2 mode that delivers such spectacular results with surround soundtracks adds a layer of processing to the stereo signal that might add plenty of spaciousness, but also hampers cohesiveness, timing and focus. Unfortunately that’s actually better than the straight Stereo mode, which somehow manages to completely unbalance the tonal range so that some instruments and notes are drowned out while others are pushed forward. Still, keep it on the virtual surround mode and use your iPhone as a source (via the USB or bundled AirWired accessory, which is unfortunately 30-pin only) and the sound is perfectly listenable, if not exactly authentic. However, while it’s a shame that the Yamaha YSP-4300 isn’t a more musical performer, it’s the movie performance that really matters here, and in that regard the YSP-4300 is just as good as we’ve come to expect from a premium Yamaha soundbar. Add future-proofing tech such as HD audio decoding and 3D and 4K passthrough of video and you’ve a neat system that will fill your room with excellent virtual surround sound. Just don’t expect it to replace your hi-fi as well.